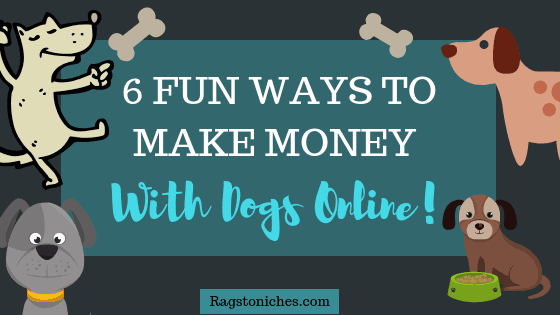 6 Ways To Make Money With Dogs Online & From Home! Last updated on February 12, 2019 By Nat Leave a Comment This post may contain affiliate links. We appreciate you supporting Rags To Niches! Full disclosure here. If you’re thinking about starting an online business, where better to base it on, than something you really love. If you’re a Dog lover, there is no reason that you shouldn’t go into that particular niche. The dog niche is HUGE and while it’s competitive, there are so many different sub-niches that you could go into within it. From Dog training, food, health and toys/bedding and even dog clothing, there are various elements you could explore. So, you know you love dogs and want to make money with them somehow…. But in what way? Today, I’m going to run over with you 6 ways that you can make money with dogs online & from home! Even a business that you can start from your home, is going to have some online elements as well. 4 Ways to make money with Cats. Choosing a niche – Passion Vs Profit. 40 ways to make money online. #1 Dropshipping Dog Products To Dog Fans! Dropshipping is a business model that I personally want to explore more in the coming year. It’s sparked my interest and curiosity for a good while, but my experience has been minimal so far. If you have an online Dropshipping store, the stock you showcase is not something you have personally. You source products from third parties and only purchase the product once a sale has been made. Of course, you sell the product at a higher price than you purchase it for. The third party also ships the product for you and you keep the profit. Consequently, you would never actually see or handle the product yourself. Well, you can set this up by creating your own webstore , using something like Shopify. Alternatively, you could download the Woocommerce plugin for WordPress. You can then seek out various pet products related to dogs with suppliers, that offer dropshipping services. Aliexpress is one of the most common and simplest options for newbie Dropshippers and there are thousands of products that you can choose from. But How Much Money Do You Need? If you’re interested in Dropshipping, you might be wondering just how much it could cost you to get started. Well, why you can potentially start Dropshipping very cheaply, many people do suggest that you should have a budget to start out, that you can use on Facebook Ads. Facebook Ads are a cheap method to get stuck into as a beginner, as you can test out campaigns fairly cheaply. That being said, you may need to test several products before you find one that actually turns a profit. You should really be prepared into investing some money into any business that you start. That’s just what you’d need to do in the, “real world,” so why wouldn’t you invest money into your online business as well!? See the handy video below, which explains some of the start up costs. The above video talks about Shopify specifically, which does have a monthly fee. However, if you have a WordPress site set up already, you can install the Woocommerce plugin completely for free. Also, it’s worth noting that you don’t HAVE to run Facebook Ads. For example; I am thinking of linking products from my shopify store, within a blog and this blog won’t only generate organic traffic from SEO, but also drive sales from Pinterest, Instagram and a Facebook page I will create. With blogging, you can also make money via additional income streams, as well as Dropshipping. It will definitely take longer than running Facebook Ads, but I want to see how well free traffic converts, before I go into Facebook Ads. Seeing as my experience online is with free traffic, it’s something I’m happy to work on in the beginning. I recently watched a good introductory training on Dropshipping over at Wealthy Affiliate, there is more training coming up as well, so you may want to check that out. (click image below to access to video training). Surely, there isn’t much money in that!? But actually, you can earn a lot more than I thought. According to thesimpledollar.com, you can earn around $3,300 if you work full time, with 2-3 dogs; or $1000 a month if you’re doing it more part-time. Although, from what I can see, most people are only charging £25-30 for overnight visits, or £10 for 30 minute visits…. So, it’s really going to depend how many dogs you have on the go. Considering the job can fit around your lifestyle and pays more than plenty of jobs out there, it sounds good to me. If you’re not looking to to do it full time, it can be a good way to earn some additional money and you can completely set out when an where you work and your own rates as well. With Rover, you can join their database and you can be found by people looking for Dog sitters/walkers nearby. You will have to complete an application form first though and then get accepted. They then will deal with all payments and bookings – although, they do take a 15% cut. However, Rover is worlds LARGEST 5-star network of pet sitters, so a reputable company to join. You can state your own rates for things like, overnight care, caring for the dog in their home, quick pop in visits and and regular dog walking. Of course, you don’t have to join a website like this, you could do it alone. Put an Ad up in an online site, like craigslist, (or Gumtree if you’re in the UK). Create flyers and post them in doors locally. Advertise in your local paper. As a legitimate side-hustle, this one is going to be a good one for dog-lovers. Obviously, this one is going to take a lot more planning and upfront cost, but this could be a really interesting one. More and more, pet owners are interested in buying nutritional, healthy and organic treats. If you could come up with a good product, that dogs enjoy, this is something you could sell locally to begin with and perhaps scale up from there. If you haven’t a clue how to make a dog treat, there are lots of recipes you can find online. You will also need to follow various guidelines before you set up your pet food business, check out the regulations for making/selling dog treats here. You may also want to check out these steps for how to start a dog treat business. While this option may have a higher barrier to entry, that doesn’t mean you shouldn’t give it a go! Print-on-demand has an element of Dropshipping to it. That is, you create the design and the print-on-demand platform of choice will print your t-shirt, (or other items, such as pillow case, or leggings…) and send them to your customer. There are lots of print-on-demand platforms, but most will require you to drive paid traffic to your shirts for good results. Merch By Amazon… Where you can make organic sales if you target the right keywords, but it is highly competitive and you need to apply to join. Etsy... You can now combine Etsy with Printful, which means you can sell your tshirts on the Etsy Platform, and get the order fulfilled by Printful. Redbubble… This platform does have some natural organic traffic, but it’s limited in comparison to the other two. While the dog niche is going to be competitive on print on demand, there are so many sub-niches that you can explore. One popular way to expand in this niche, is to cross two niches together in a unique way. Such as in the case of this Pugicorn shirt below, that combines both Pugs and Unicorns. Or what about this adorable pug sushi shirt – combining the love of Pugs and Sushi! Well, I’m not a designer either and still managed to make sales on Merch By Amazon. However, the good news is, that you can also get designs created for you at low cost. Since I’m not a designer, I am still planning on outsourcing some designs – although, some people still have lots of success with simply text shirts, or shirts with a simple image. The great part about this side-hustle, is that you really can start for free, if you create your own designs. Also, if one design takes off and becomes popular, on somewhere like Amazon, you could end up making commissions for many months – or even YEARS into the future. #5 Are You Crafty? What About Dog Products On Etsy! If you have some creative/artistic ability, you may consider going into the Dog niche on Etsy. In fact, even if you don’t know how to make anything, there are so many tutorials on YouTube now showing you how to make products, that it wouldn’t take long to learn some relevant skills. You send them a good quality photograph of your pet and they can create these badges for you, which I think look really cute. There are lots of YouTube videos online, showing you how to create your own pins pretty easily. So, it’s worth taking a look if you are more of an artistic type. Another option could be something like, creating your own Dog related gift cards. Again, there are lots of tutorials online about how you can create your own gift cards and sell them online. So, you should be able to gather plenty of information for free. One of my friends started creating and selling jewellery on Etsy, after solely learning how to do it via YouTube tutorials. I saved this until last, although it would be my favourite option for beginners. That’s because, there are so many different ways you can make money from a niche blog. One of the more common ways would be via affiliate marketing. If you don’t already know, that is when you link to a product or service on your blog and if your visitor clicks your link and makes a purchase, you make a commission. How much you make, is going to really vary depending on the affiliate program. For example; I linked to Etsy above with affiliate links. If you clicked the link and made a purchase in the next 30 days, I would make 5% of the sale if you’re a return customer, or 8% if not. While Etsy has rates of 5 & 8%, other affiliate programs have much higher commissions and you would be able to access thousands of potential programs online. However, as well as affiliate marketing, you can incorporate paid advertising and sponsored posts on your site. In addition, you can even use Dropshipping!! I’m currently creating a niche website and fully plan on incorporating Dropshipping into the equation. There are just so many ways that you can ultimately profit from having your own website and through the process of building it out, you also learn a lot of skills that can be transferred to other businesses. For example; learning about online marketing, will help me when I launch my Dropshipping business. In addition, learning about keyword research, (which you need to learn in order to get free traffic from the search engines) helped me to make money with Merch by Amazon. My no.1 recommendation for learning how to create a money making website, is Wealthy Affiliate. It’s where I got started several years ago now and it’s just getting better and better. You can access a >> free 10-part course here and check it out for yourself. Do you have some other ideas for how to get started in the dog niche?